These Lizards are usually about five Inches long, of a dusky green Colour. They frequent Houses, are familiar and harmless, and are suffered with Impunity to sport and catch Flies on Tables and Windows, which they do very dexterously, and no less divertingly. They appear chiefly in Summer, and at the Approach of cold Weather, they retreat to their Winter Recesses, and lie torpid in the Hollows and Crevices of rotten Trees. These Lizards change their Colour in some Measure, like the Camelion, for in a hot Day their Colour has been a bright Green, the next Day changing Cold, the same Lizard appeared brown. They are a Prey to Cats, and ravenous Birds. It frequently happens that a few warm Sun-shiny Days so invigorates them, that they will come out of their Winter Retirements and appear abroad, when on a sudden the Weather changing to Cold, so enfeebles them, that they are incapacitated to creep to their Winter Holes, and die of Cold. 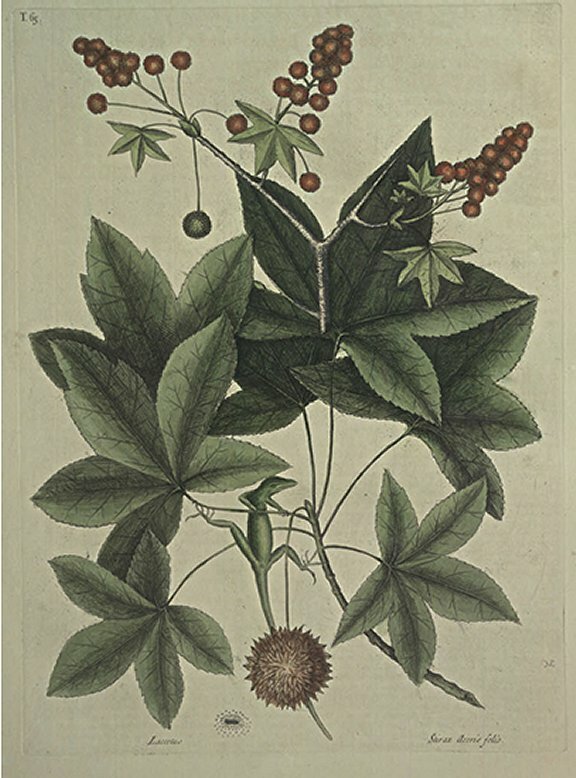 The Trunc of this Tree is commonly two Foot in Diameter, strait and free from Branches to the Height of about fifteen Feet; from which the Branches spread and rise in a Conic Form to the Height of Forty Feet and upward from the Ground. The Leaves are five-pointed, being divided into so many deep Sections, and are set on long slender Pedicles. In February, before the Leaves are formed, the Blossoms begin to break forth from the Tops of the Branches into Spikes of yellowish red, pappous, globular Flowers, which when the Apices are blown off by the Wind, swell gradually, retaining their round Form, to the full Maturity of their Seed Vessels, which are thick set with pointed hollow Protuberances, and spliting open discharge their Seeds, each Cell containing a Seed, winged at one End with many small Grains, distinct from the Seed. The Wood is good Timber, and is used in Wainscoting, &c. The Grain is fine, and some of it beautifully variegated, and very fit for curious Works in Joinery, but when wrought too green, is apt to shrink and fly from its Joints, to prevent which no lets than eight or ten Years is sufficient to season its Planks; yet the regular Form and Beauty of this Tree deserves the Regard of the Curious, none of the American Trees affecting more our Soil and Climate. From between the Wood and the Bark of this Tree issue a fragrant Gum, which trickles from the wounded Trees, and by the Heat of the Sun congeals into transparent resinous Drops, which the Indians chew, esteeming it a Preservative of their Teeth: The Bark is also of singular Use to them for covering their Houses, which has frequently given me an Opportunity of gathering the Gum from Trees so strip'd of their Bark, one of which would yield an Hat full of Gum. This Gum smells so like the Balsam of Tolu, that it is not easy to distinguish them.